Across the globe, Dr. Jane Goodall is considered one of the foremost conservationists, anthropologists, and environmental rights leaders. As a UN Messenger of Peace and Founder of the Jane Goodall Institute, she has been educating people about the importance of protecting our planet's animals, biodiversity, and vital ecosystems. Working in close partnership with the Jane Goodall Institute (JGI), WIJABA is in the process of introducing the Jane Goodall Institute's "Roots & Shoots" environmental awareness program across our network of WIJABA libraries in Sidoarjo (East Java) and Padang (West Sumatra), Indonesia. Indonesian Rainforests: Cover just 1% of the Earth's surface, but are home to 50% of the world's fish species, 17% of bird species, 12% of mammals, 10% of reptiles and amphibians, and 10% of plant species. Mammals: 515 mammal species in Indonesia - more than any other country on Earth; 135 are threatened (also more than any other country). Rank: Indonesia's rainforests are the 3rd largest in the world, after the Amazon and Congo Basin. Unidentified Species: It is believed that 50%+ of Indonesia's plant and animal species have yet to be identified and recorded. Deforestation: Highest rate of deforestation in the world. Deforestation Rate: Accelerating - from 84% of Indonesia forested (in 1900) to 48.8% today. Illegal Logging: Between 73-88% of all logging in Indonesia is illegal. 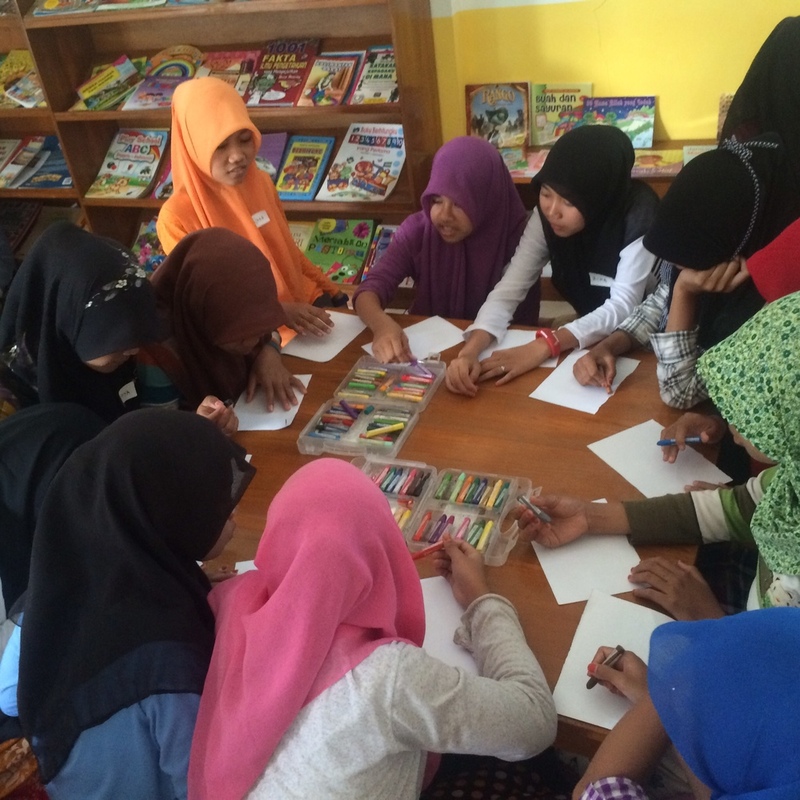 Through this unique program WIJABA intends to reach thousands of Indonesian schoolchildren through this new education program by tapping into the existing network of libraries and schools served by mobile libraries, which currently number more than 100. The World is Just a Book Away and Jane Goodall Institute's "Roots & Shoots" Environment Program will be a truly collaborative effort. WIJABA is honored to have Ms. Mary Lewis, Vice President/Outreach of the Jane Goodall Institute and long-time Assistant to Dr. Jane Goodall, as a member of our WIJABA Advisory Board. Dr. Jane Goodall - a long-time supporter of WIJABA - attended the opening of a library in her honor at the Sidhi Astu Orphanage in Bali, Indonesia on June 15, 2014. At that time, we announced our intent to launch h the Jane Goodall Institute's "Roots & Shoots" Environment Program at 80 schools served by WIJABA Libraries and Mobile Libraries by the end of 2015. With a balance of books, multimedia, activities, lessons, and group discussions, this program will be both insightful and engaging. The children will then work together to come up with creative and thoughtful solutions that positively address an environmental challenge for people, animals, or the environment, and then be given practical instruction and guidance on how to successfully implement one of their ideas in their respective schools and/or communities. In order to ensure sustainability of these efforts, participating children will also be charged with conducting meetings year-round (with a WIJABA staff person as an advisor and mentor), taking on projects that promote environmentalism and peer learning, and implementing at least 1 special project per year (with a small budget provided from WIJABA to do so). These project ideas should be concrete ways in which they will 1) share the knowledge that they learned from this "Roots & Shoots" Environment Program with their peers, families, communities, etc., and 2) implement a service project that will positively impact their environment and help to preserve it. "Founded in 1991 by Dr. Jane Goodall and a group of Tanzanian students, Jane Goodall's Roots & Shoots is about making positive change happen - for our communities, for animals, and for the environment. Today, Root & Shoots is the Jane Goodall Institute's global environmental and humanitarian youth program, which involves nearly 150,000 young people in more than 120 countries. Through Roots & Shoots, young people from preschool through college work with youth leaders and adult mentors to gain a better understanding of the issues and challenges that affect their immediate community, as well as the world at large. Each group identifies issues that concern them and then creates hands-on projects to make the world a better place. Roots & Shoots activities take place in all kinds of settings, including classrooms, home schools, nature centers, neighborhoods, refugee camps, zoos, scout troops, and even around the dinner table. In a fun, flexible and supportive environment, young people and adults alike connect with one another, share ideas and inspiration and endeavor to effect change in their own neighborhoods or even in different time zones or hemispheres. Roots & Shoots makes it a priority to help young people connect with one another across miles, boundaries and cultures. The dynamic, interactive Roots & Shoots website, www.rootsandshoots.org, provides members with helpful online tools, allowing them to take action, connect globally and combine forces. Discussion boards, project sharing, e-newsletters, and downloadable resource enable youth to creatively and collaboratively take action. With Jane Goodall's Roots & Shoots program, the power of youth is truly global."